We’ll look today at interior entries and foyers, and the importance of repeating shapes, colors and motifs for unifying the space. 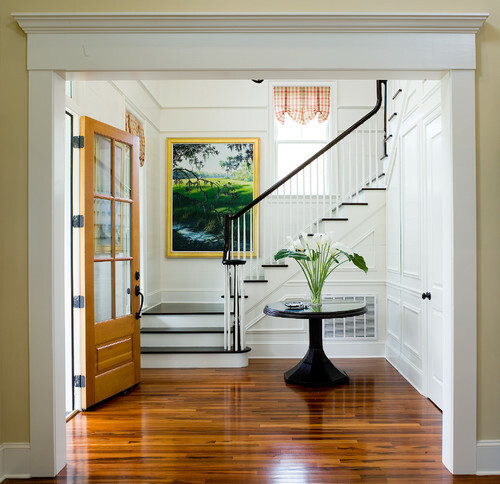 So, let’s look at what works with interior entries/foyers, from grand to humble. And for clarity, I’ll mention a few things that in my opinion don’t work. ABOVE: We have a nod to the water with the vintage photograph of an outrigger. I would guess that with the millwork and dark floors and hydrangeas, that this home in in the Hamptons. Why does this work so well? From a color perspective, it is the repetition of the color black. Two pieces of substantial ebonized furniture, black floor, black melon stools, black iron strapping and chain on the bell jar light, black handrail on the stairs, black and white photo, etc. Beautifully done. ABOVE, another example of repetition of the color black, not as pleasing as the first one above, in my opinion. The heavy iron scroll-work of the stair is too lyrical for the graphic geometric black and yellow-white flooring. The copper sconce lighting flanking the door into the parlor is completely ill-placed, and competes/clashes with the brass finish of the stair rail and the gilding of the accent chair. The lonely chair doesn’t take up enough visual space in the area. It doesn’t make sense there. Repeating the geometric shapes of the picture wall and flooring on the iron work would definitely help unify this space. 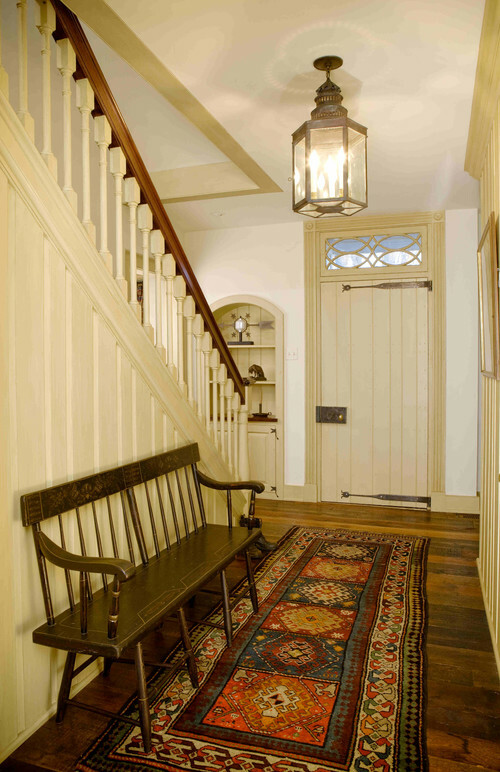 Traditional Entry design by Boston Architect Albert, Righter & Tittmann Architects, Inc. Above, the overall look is stylistically right. Very nice look. Great proportions and geometric repetition. If I had to find fault here, I would say that the paint shouldn’t be all high-gloss. I find all that glossiness a bit distracting. The Oriental rug is a warm and inviting counterpoint. What do you think of this one, below? I happen to think it works nicely. I love the repetition of movement and curvy lines in the rug, painting, and platter, also repeated in the table joinery and chairs. Gorgeous warm wall color with the wood, possibly Benjamin Moore HC-36, Hepplewhite Ivory, repeated in the rug and in the painting. ALL YOU DÉCOR BUFFS WHO LOVE GRAY RIGHT NOW, DOES THIS, below, DO IT FOR YOU? I personally find the coloration more than a little lifeless, but I do like the dark sculpture of the woman against the left wall. I think the sculpture is stunning. The overall balance of light and dark in the space is amazingly well-done. But, gray MUST have a color to bring it to life. That is what is lacking here. SIMPLE AND BEAUTIFUL, above. A great example of good design that probably didn’t cost a fortune. What is repeated here? WATER REFERENCE: See the subtle reference to the ocean in the coral print pillows and the jaunty black and white photograph? Both repeating the reference to the water. Just enough. VERTICAL LINES: The slats on the settee repeat the vertical lines of the tongue in groove panels and the vertical border of the rug. Also, the center pillow has a strong vertical motif. BALL/CIRCLE MOTIF: The circles on the two end settee pillows repeat the balls of the little sconce. Are you seeing that when things are repeated, they are more pleasing to the eye? COLOR HARMONY: The pale blue wall is perfect with the pinky-beige paver tiles. No clashing undertones in this humble but lovely space. 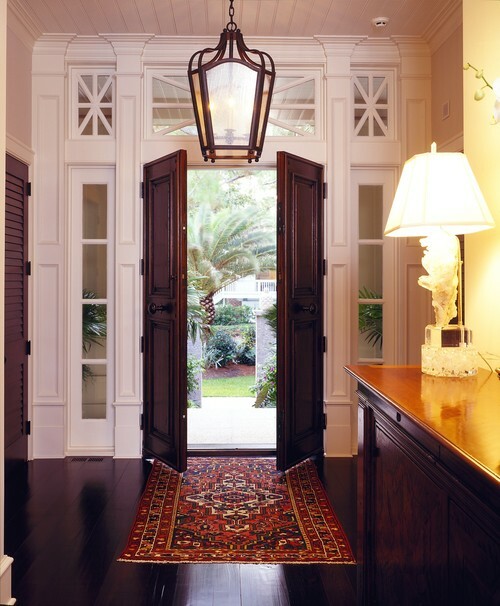 Above, BRITISH COLONIAL-INSPIRED PERFECTION. Stunning. I love every single rich detail. The dark brown mahogany color is repeated four times, five including the iron lantern. The Starburst motif in the glass transom repeats the shape of the palm tree just outside, and references the shape of the lantern top as well. My favorite of all these! 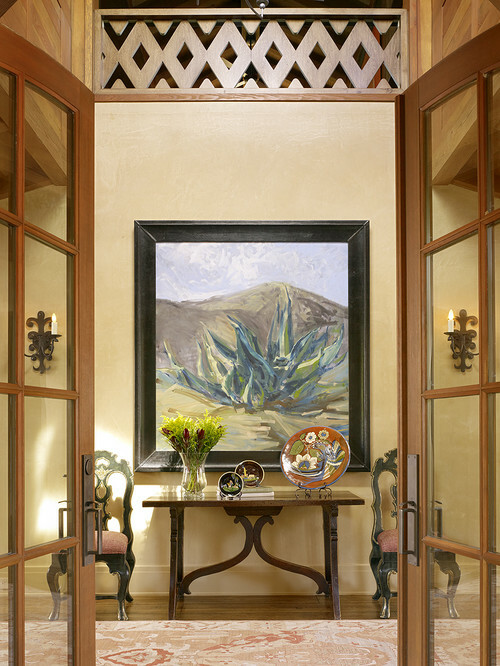 THE MILLWORK IS NICE, AND THE PAINTING MAKES A BEAUTIFUL STATEMENT ON THE LANDING. THE HANDRAIL IS PERFECT. However, they should have repeated the black, on the door. The ash finish of the wood door is off, it needs to be black.The countrified rust and beige check coloration on the relaxed-Roman shade comes out of nowhere, do you agree? I think a cozy ebonized settee with a soft cushion covered in a rich emerald green (cue color from the oil painting) would be much prettier and more welcoming than the oddly place round table, and would have kept your eye away from the A/C return vent. And, if I were styling this entry, I would certainly add a rug. Additionally, I find the flooring a tad busy since it is stained a different way than the stair. P.S. I hate rounded door hinges. See prior post on Does your Million Dollar Home have $2 hinges?. I would paint out the return vent, above (see how it is glaring black behind the console? ), but love the shape of the barrel vault repeated in the arched back door and the arches underneath the console. The end sweep of the curve of the banister repeats the shape again, as do all the curvy/round accessories. As a color specialist, though, I would have suggested a wallpaper for the top portion of the walls above the millwork. This space needs a little more interest, possibly a muted Jacobean motif wallpaper on the upper walls. NEVER OBSTRUCT YOUR STAIRS, but otherwise love this rustic rear entry, below. Can you name the two main repetitions used here to nice effect? FARMHOUSE PERFECTION, below. Repeating the color black again here. I could just die over the iron door strapping and original hardware. The arch of the bookcase references the ellipses in the transom, and repeats in the lantern as well. The strong vertical lines of the tongue in groove paneling, stair spindles, and bench spindles work perfectly. The rug has motifs which reference each of these. 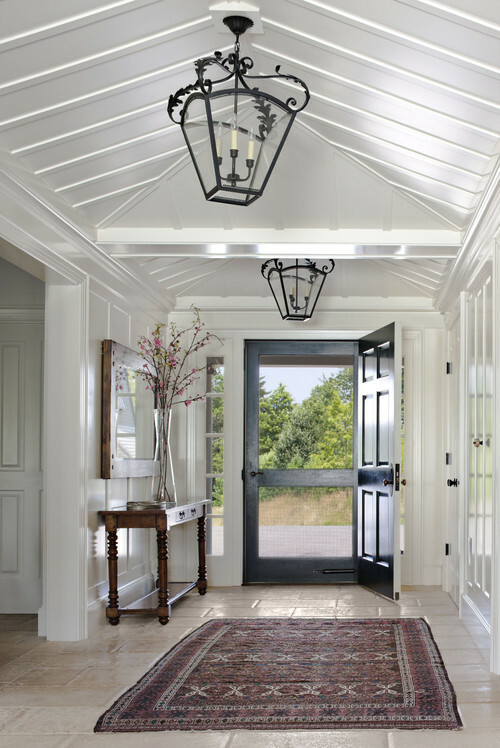 Are you using repetition in your entry-way to best effect? Can you think of anything your entryway has that you could repeat another time or two? Which one of these entries do you like most, do you have a personal favorite? This entry was posted on July 21, 2012 by Ellen at Color Calling. 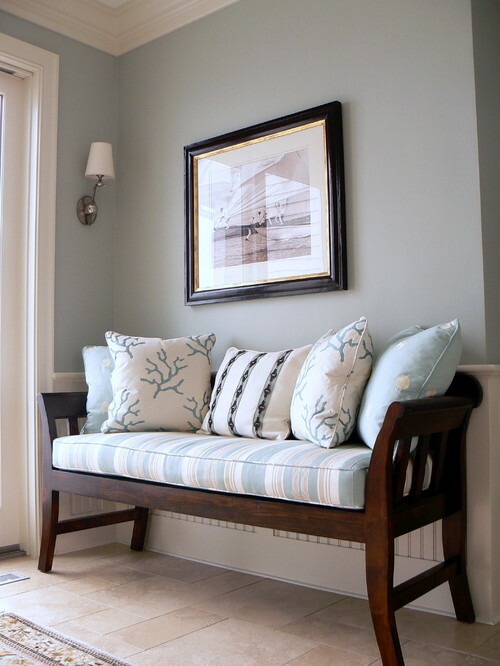 It was filed under Benjamin Moore colors, Entry, Front door entry, painted paneling, Residential styling, using the color white and was tagged with motifs, repetition, shapes.